Valencia is the third largest city in Spain and is its third largest city in Spain behind Madrid and Barcelona. The city is on the Mediterranean Sea and the banks of the Turia River. Major monuments in Valencia include the Valencia Cathedral, Torres de Serranos, Torres Quart, Llotja de la Seda which is a Unesco World Heritage Site, Museu de Belles Arts de Valencia, Ciutat de les Arts i la Ciences, and the Valencian Institute of Modern Art. The city is well known for the Falles local festival, the La Tomatina tomato fight, and several other catholic festivals held each year. The city is also host of the European Grand Prix Formula One race. 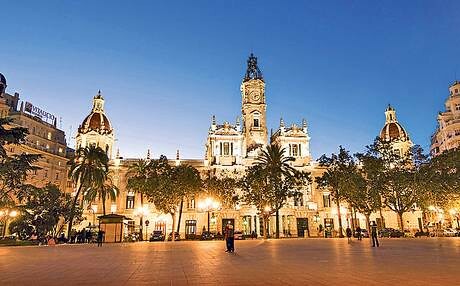 Valencia has a subtropical climate with mild winters and long warm to hot summers. Valencia is home of one of the traditional Spanish dishes the paella and the cuisine is also world renowned in the city. Other specialties include the fartons, bunuelos, Spanish omelettes, rosquilettas, and squid. Places to eat include the Raco de Turia which is close to the city’s river banks and is ranked among the top fifty restaurants for Spanish cuisine in the city.